WordPress 5.2 is right around the corner. It is expected to be released sometime towards the end of this month. WordPress 5.2 will bring new features and the usual bug fixes and enhancements you would expect in a core update. I’m going to introduce you to some of the changes that are coming and what they mean for your website. Love it or hate it, the block editor is receiving a bunch of improvements in the 5.2 release. Some of the changes are going to fix issues that I have personally noticed when working with the editor. Other changes include fixing some very prevalent accessibility issues. WordPress 5.2 is going to introduce more blocks for your website, which is great. Some of them are useful and then there is the Amazon Kindle embed block. RSS Block (fetch and display any RSS feed). Search Block (standard WordPress search widget as a block). Calendar Block (again, a standard widget that we know and sometimes user converted to a block). Now, I could just skim past this but I want to address the Amazon Kindle embed block in more detail. I was not aware you could embed anything from Amazon Kindle in the first place. In the thousands of websites I have worked on, I have never seen this. But here it is, which makes the next major feature even more important. The Block Editor has seen a lot of new block introductions lately. Mostly through plugins. Atomic Blocks, notably. This is great. I am glad there are so many options out there, but you will almost never make use of all these blocks. If you are, I have to ask what are you using the Amazon Kindle block for? I am genuinely curious. But the essential premise behind the block manager is that you can disable blocks you’re not using. Now, you would think, well that means we can expect a performance improvement right? There should be some set guidelines on asset management for blocks. It is not like developers can’t check and see which blocks are being used on specific pages. There was a lot of discussion about this issue on Github, that kind of went nowhere. But, block management is here. If anything, it makes it easier to find the blocks you actually want to use, but it does nothing for performance. WordPress is getting smarter because some people make dumb decisions. A little harsh, I know, but it is true! How many times have you accidentally blown up your own website by copying some PHP into your functions.php file and then having to crawl through your FTP client or File Manager to fix it? The way Fatal Error Protection works is there is now an integrated recovery mode for site administrators in WordPress. If an error is generated, WordPress will email the site administrator with a special login link to recover the site. If you use that link, you will be able to login to WordPress and undo any changes that may have triggered the error. My understanding is this is basically an advanced form of the troubleshooting mode in the Health Check plugin. Rule #1: Don’t edit live theme files. At WordCamp U.S 2018, this announcement received more applause than Gutenberg. It is sad and a little bit funny, but true nevertheless. For those who are unaware, PHP is the programming language that WordPress uses. Older PHP versions are insecure and incredibly slow. WordPress being as considerate as it can, has said we will keep supporting PHP all the way back to PHP 5.2.4. Just for reference, PHP 5.2x has not received any updates since 2011. Those were simpler times. Gutenberg didn’t even exist as a concept yet. In all seriousness, there is no reason to use PHP 5.2, unless you like a slow and insecure website. Please, update your PHP. Now, I could have ran some benchmarks myself, but it’s 1:30 AM. Therefore I am going to use a chart from Phoronix. 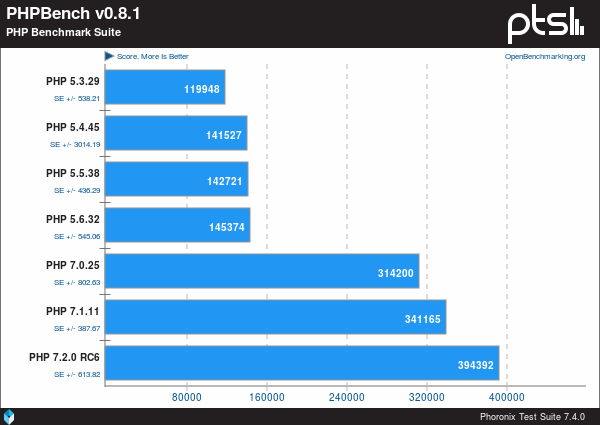 This chart is a PHP benchmark of versions back to PHP 5.3, because 5.2 is just too old. You can see there is a certain boost around PHP 5.3 and 5.6 and an even larger boost from version 5.6 to 7. People will commonly say that PHP 7 is twice as fast. Technically it is, but if you’re running on a cheap $2/month host, it won’t matter. Regardless, it is still faster and much more secure. If you’re running on anything less than 7 today, you need to get that fixed. 3. Move to a different host. Here are some WordPress hosts that I recommend. WordPress 5.2 will require PHP 5.6 to install. Update your PHP version and then you will be able to receive the latest update. If you don’t, prepare for nag notices. There are some other minor changes that are coming to WordPress 5.2 that are cool as well! Plugins can specify minimum PHP versions. Dashicons will be getting more icons for me to continue disabling. You can also set a location for the log file for the debug log feature which is cool. That’s about it. WordPress 5.2 is bringing a lot of good quality of life changes and the Kindle Embed block. Keep your eyes out as it’s supposed to be released this month!